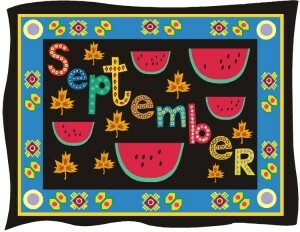 I hope September is a great month for all of you! I will be so glad when cooler weather gets here! Our cats & dogs lie on the floors in the house “cooling it off in a full flounder” as we say – flat on the floor! We keep food & water outside in large containers for all the little critters that come both day & night – this is a record breaking summer here in Houston and it can’t leave soon enough for me!!! I’m ready for this long Labor Day week-end too – ‘nesting’ on the sofa with my iced tea & books!!! Aha, Petie, that’s exactly how Sprite would lay… sort of like all of her legs doing the splits. So sorry to hear your daughter is returning to the east coast after what sounds like a lovely summer (despite the strange weather). We’re hoping September cools down here in Colorado – we’ve had record highs. Been waiting for Sept so hopefully here in the Phoenix area we MIGHT get lower than 110 degrees! I know everyone was hot this summer….we broke all our own records even…days above 110 degrees, days of excessive heat, I believe we had 20+ heat related deaths, and everyday practically for months we broke daily highs. So we need to get thru Sept and Oct and then it will be 4 or 5 continual months of the greatest weather in the world and the reason we all live here!!! Got some great books to read this Labor Day weekend and gonna chill in the air conditioned house for a read-a-thon I believe!! Enjoy your read-a-thon this weekend, and keep your air conditioning at full speed ahead, Sandra! Where will she be living on the East Coast? I live in the Washington DC area. We have had some exciting times here lately with an earthquake and a tropical storm. Anna, she spent the beginning part of her summer in DC, and will be heading back east… right outside Boston. Yesterday I visited my local libraries in order to find a book or 2 , or 3! that would help me get through this holiday weekend. I have almost all of my favorite authors in the ” new Release ” sections and just nothing else seemed intersting. Does anyone else ever have that problem of going to a book store or library and not finding anything interesting? What do you do? I finally just picked out a few books by new-to-me authors that I thought would interest me. I did bring home about 15 books! Should keep me busy! This would have been a good weekend for a new Anna Pigeon or Kinsey Millhone novel! It happens to me a lot. I do what you just did–I come to sites like this and ask for recs. If you like Kinsey Millhone, check out Elizabeth Cosin–she was out of print, but she’s on Kindle now or you can find the books used (or maybe library?) I liked them even better than Kinsey. Let’s see. There’s also Marcia Mullner, not quite as good as Kinsey, but the early ones are pretty good. You might enjoy Linda Fairstein too, but those can be a little dark. And this cozy site is full of some awesome cozies! Linda, I also have that problem from time to time. That is usually when I try a new-to-me author who I have been meaning to read for a while. I get them from reading the comments you all post about authors who you like. Shouldn’t this inspire a bird or empty nest related mystery theme? (although I can only think of Cat Among the Pigeons). 🙂 My children are still little; I’m not looking forward to when they head off for college. Vickie, as hot as it has been for us, I can’t imagine wearing a sweater these days. I hope the cool weather continues for you all! I think we finally stayed under 100 yesterday–but today it’s supposedly going back to 101 and it felt like it would get there on our walk this morning. I’m with the other posters–I’ve got several books lined up and it’ll be iced tea even though I prefer hot tea. I’d sure like to plant some tomato plants for the fall, but it’s just too hot right now and time is short for them to make it before it freezes. Argh. Maria, it looks to me like this Labor Day weekend is going to see a lot of mystery reading by a lot of mystery lovers! We broke a “all-time” record by having 50 days ( so far ) that are 100 degrees or higher.. Sounds like you have had a wonderful Summer spending time with your daughter! I hope she has a safe trip back to the east coast. Im looking forward to reading alot this weekend, including a cozy by Joanna Carl and another cozy by Heather Webber. Oh, Melissa B, I had no idea it has been so bad out in Kansas! Fifty days of 100* or more is unheard of out there!!! What ever did they do before air conditioning?!? I hope you enjoy your reading… in the comfort of your air conditioned home. Suprisingly here in the Lowcountry of SC we have had a really hot summer but not had many days in triple digits. We have had high 90’s and heat indexes up to 111 , but compared to other areas we have been blessed. It is going to be in the mid to upper 80’s this week but I am so ready for winter such as it is here. The older I get the less I can deal with the heat – thank you to whoever invented AC! I have some sweet tea and a huge TBR pile plus a couple of library books so I am good to go for the long weekend! Maria from bear Mountain books commented on a certain author’s books being out of print but are available on Kindle. I have seen some of my friends’ Kindles. These Kindles seem like they would be good for when a person would travel, get stuck waiting forever in the doc’s office, lunchtime at work(etc) . My concern would be is if I would purchase a book or Kindle would I be able to delete it or would I be stuck with that book forever? I know this isn’t the topic here but just wondering! I love holding the book in my hand; being able to share, being able to donate used books to the libraries or selling these at a garage sale. Just a thought-won’t these be hard on the publishers? but then again, maybe Kindle will force the cost of books to go down somewhat. Books are getting rather costly. Linda, I got my first Kindle three years ago and wouldn’t be without one. You can remove books from the device but they always remain in your archives at Amazon so you can retrieve them later if you wish. When you click on that you will get a list of all the books or other publications in your archive and there is an “Action” button on the right that gives you the choice of downloading to your Kindle (s), to your computer, if you have chosen that option, transfer via USB or loan to another Kindle user. I have almost a thousand books in my archive but only keep twenty or so on each Kindle. There are hundreds of FAQs on Amazon’s Kindle site. Hi all Out here in the San Francisco bay area we are still waiting for summer. The hottest it got here this summer was 105. I am 40 miles east of SF and we usually have low 90’s to high 100’s here but not this year. It is a below normal summer, one of the coolest on record for us. Welcome back, Alfred! With the rest of us experiencing record heat, you have been way under the temperature radar!